Oh hey, Bran. Too bad about the Three-Eyed Raven, but you’re hanging with Uncle Benjen, so you’re safe—for now. We’re not really sure how far you can get in your training to become the new Three-Eyed Raven in one episode, but we bet you’re going to have a vision of two people whose names rhyme with Brianna Park and Hagar Shmarshmaryen. After last week’s dragon-based display of power, things will likely be pretty quiet in Meereen, although some decisions that will affect the course of season seven might be made. 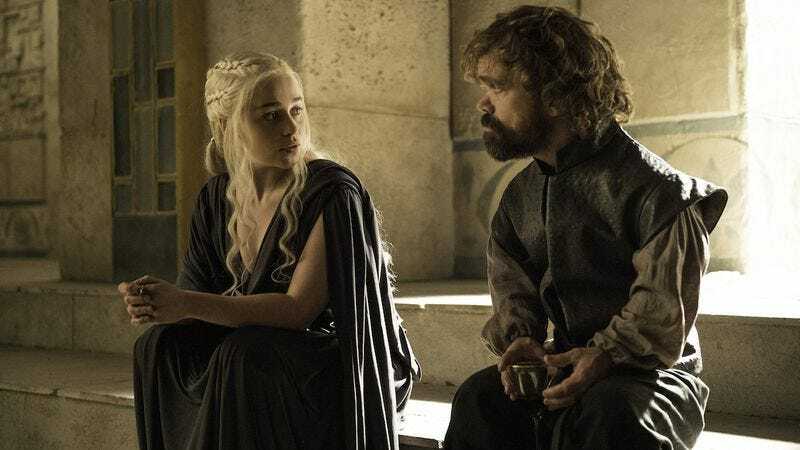 The “next on” trailer after last week’s episode saw Daenerys and Tyrion discussing her father’s evil nature, which is presumably also what they’re talking about here. Honestly, Davos, we have no idea how you didn’t figure out this whole Shireen thing earlier, but you’re definitely going to make a speech about it. Walder Frey. You’re so gross, and a weasel to boot. You’re also dumb enough to think you can out-scheme the Lannisters, which you can’t. Oof, Loras. You might be screwed, buddy. But Marjorie is looking out for you, and there’s always the chance that those “rumors” Cersei and Qyburn were talking about was the stash of wildfire the Targaryens supposedly stashed under King’s Landing, and she’ll burn the whole city to the ground before she’ll let the High Sparrow win. Not that that’s a much better outcome for you. Also, still no Dorne, huh?